\ fossil * plants excess of 1 indicate well-drained soils (Retallack 1997). 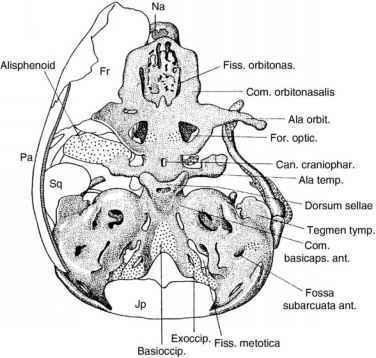 By these criteria, the petrographic and chemical data on the 18 Ma Tek paleosol from Rusinga Island Kenya (O Figure 13.3) indicate a fertile Inceptisol that was nonsaline and well-drained. These data allow identification of analogous modern soils (Retallack et al. 1995) and refine understanding of the ancient landscape and its ecosystem (O Figure 13.4). Carbon isotopic compositions of paleosol carbonate were at first thought to be useful indicators of grasslands because most tropical grasses have a C4 photosynthetic pathway which creates isotopically heavy carbon (Cerling 1992). The most prominent failure of this technique was application to the Middle Miocene (14.4 Ma) locality of Fort Ternan, with paleosol carbonate isotopically like rain forest (Cerling et al. 1997a), but fossil soils, grasses, trees, and antelope like those of a mosaic of wooded grassland and grassy woodland (Retallack 1991a, 1992; Koch 1998; Turner and Anton 2004). Subsequently it was found that even tropical grasses used the C3 photosynthetic pathway until about 7 Ma or younger (Cerling et al. 1997b; Fox and Koch 2003). The quality of graze (C3 more nutritious than C4) can be assessed by isotopic studies of teeth and paleosols, but the question of grass or shrub diet is better assessed from mammalian tooth microwear, hypsodonty, and cursoriality (MacFadden 2000). The advent of C4 grasses within tropical grasslands is most likely related to declining Late Miocene atmospheric CO2 content (Cerling et al. 1997a). 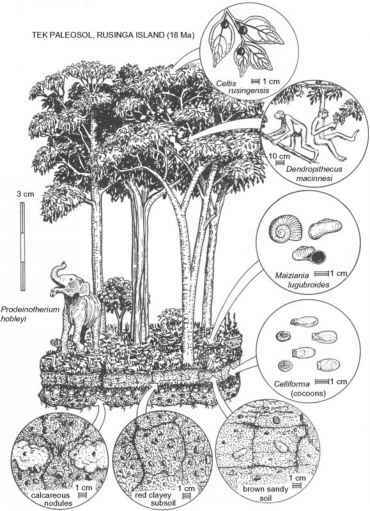 Another failure of carbon isotopes to indicate past vegetation is Sike's (1994) forest interpretation of the paleosol at Olduvai fossil locality FLK yielding Australopithecus boisei. This paleosol with relict bedding, zeolites, little clay, and shallow carbonate is unlike forest soils, and probably supported salt-tolerant, lake-margin shrubs (Retallack 2001a), which have a similar C3 isotopic value to forest (Sikes 1994). Isotopic values of carbon and oxygen in paleosols and animals are controlled by so many factors that biotic and pedogenic constraints are needed (Koch 1998). Carbon isotopic studies of paleosols are now more useful for assessing atmospheric CO2 from carbonate and organic isotopic offsets (Ekart et al. 1999) and soil productivity from isotopic depth functions (Yapp and Poths 1994). Carbon isotopic depth profiles of paleosols also provide new insights into carbon cycling within different kinds of ancient ecosystems. Grassland paleosols (Chogo and Onuria pedotype of O Figure 13.5) show more effective humification at the surface (higher 813C values) than woodland soils (Tut of O Figure 13.5), and swelling-clay paleosols have flat carbon isotopic profiles due to soil mixing (Chido of O Figure 13.5). Preservation of such carbon-cycling signatures known from modern soils within different pedotypes gives additional evidence for paleosol classification and interpretation (Bestland and Krull 1999).